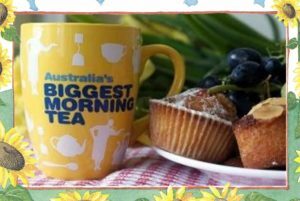 Biggest Morning Tea. May 2018. The Biggest Morning Tea event went off very successfully, with a lovely range of food on offer. Some amazing cooks in our ranks by the looks of things! A “Big Thank You” to Nola May along with President Denise – they really make a great sandwich – as well as Chris Price, Linda Sinclair and Brenda Emerson who helped tremendously with organising the donated and made “Goodies”. Thank you to anyone else that helped. Barbara Kent, donated some Knitted Rabbits and Bears for sale and all proceeds went to the BMT – Thank You, Barbara.